Sakura season in Tokyo is beautiful, but at the same time the crowds can be rather discouraging to venture out in a public park. 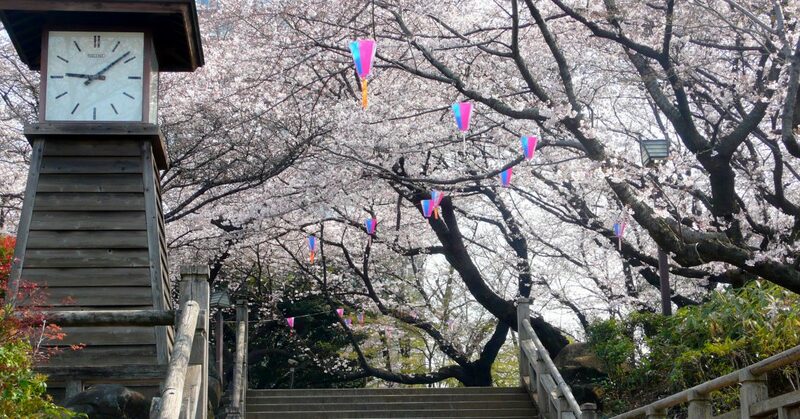 While enjoying the pretty pink delights together with other people over a drink is one of the key elements of hanami, it can become rather burdensome as well to face the huge crowds. There is, however, a park in the north of Tokyo, located on top of a hill, that is very special and at the same time unchartered territory for most foreign tourists. 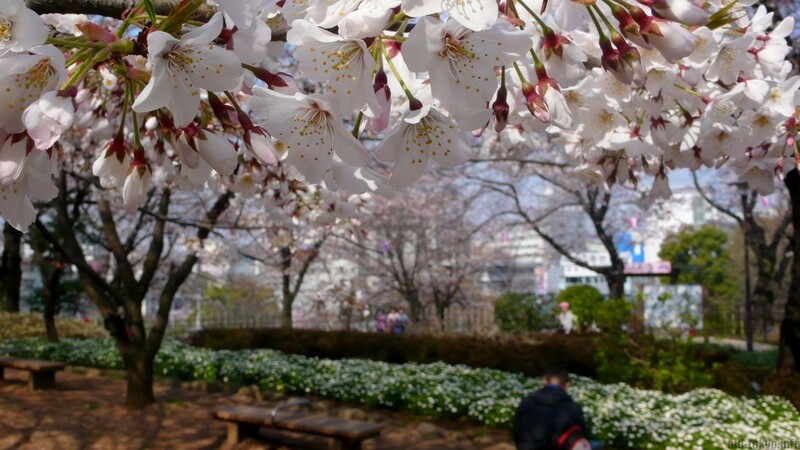 It was one of the major hanami spots in Edo (old name for Tokyo). Asukayama Park (Asukayama means “Mount Asuka”) opened in 1737 by Tokugawa Yoshimune (1684–1751, reign as shogun: 1716–1745), who ordered the planting of hundreds of cherry trees in 1720 in order to create a place for the Edo inhabitants to enjoy some leisure time. Different from Kan’ei-ji temple (nowaydays Ueno park), people could come here and drink and eat under the trees, making this one of the first places were the custom of hanami developed into what we experience today. There are currently about 650 cherry trees. Together with Ueno park and several others it was transformed into a public park at the start of the Meiji period (1868-1912). A scene from the park has been immortalized in one Ukiyo-e from Hiroshige in his One Hundred Famous Views of Edo (1856–59). Red bushes further south in the park. The highlight of the park is its northern tip, to which you can go with a free monorail ride. From this northern side, you have a nice view over the surrounding area. From here you can move south-east through the main sakura lane. 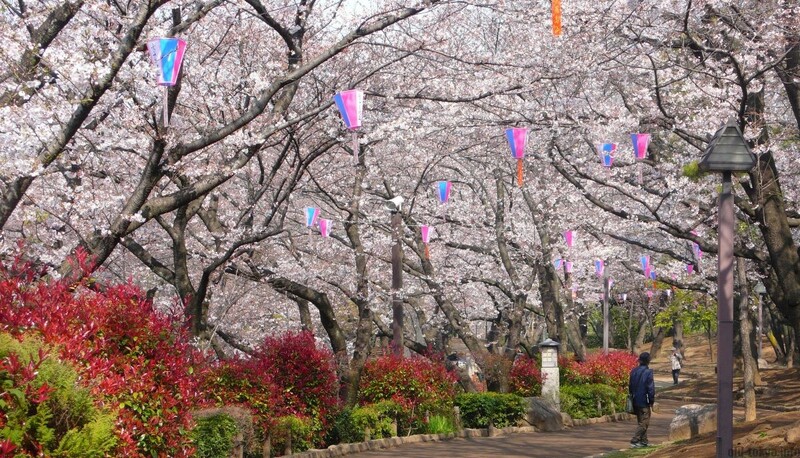 Under these trees there is plenty of space to hold a hanami party. Further south is a large open paved area surrounded by sakura trees where it is also possible to sit, but the stone surface might be a bit too hard to relax for a long time. The free monorail will take you from the station up to the northern tip, a whopping 17.4 meters higher. This short monorail operates from 10:00 in the morning and 16:00 in the afternoon. It is mainly meant as a sort of elevator to provide easier access for the physically impaired and elderly. There is a long path from the monorail entrance, following the whole northern side of the park. The park itself is situated on a higher plateau, and you can follow this path all the way south. It follows the northern wall of the park and brings you over through several steps and stairs to the playground area. On one side you have many train lines pass by, making it a good photo opportunity for train geeks. I noticed many people who were walking here were less interested in the flowers (as evidenced by their large cameras pointing towards the nearby train lines). The long path at the side of the park, which gives you great views of the trains that are passing by. It is a small train otaku paradise as you will have many lines of commuter trains, as well as shinkansen and the Narita Express. Paper Museum: Everything you ever wanted to know about paper. The reason why it is here is because a large paper manufacturing company was established in Oji. Asukayama Museum: Local historical museum. Has a cafe on the 3rd floor you can enter free of charge. Shibusawa Memorial Museum: A museum about Shibusawa Eiichi, a leading figure in the development of Japan’s modern society. This museum includes two historic buildings and a Japanese garden that were part of Mr.Shibusawa’s residence. In earlier times, this small mountain park used to host Asukayama Castle. At the place where it was built is now a memorial stone, erected in 1737. Only 100 years ago there was a beautiful teahouse called Oji-ya on the Otonashi River (link to old photo). Unfortunately, both are gone. I can’t help thinking that this park could have still had a more prominent place in Tokyo if any of these were still around. In more recent history, a Sky Lounge (link to old photo) was built here to have a nice view over the area, but it was demolished in 1993. Benches at the northern tip, with behind it the view over the city. Budget? free entrance for the park and monorail. Entrance fee of JPY 300 for the museums. Why visit? One of the oldest sakura spots in Tokyo, beautifully located park on plateau.